Phase three of Belgrade has just got planning permission. Part of it is a 21 storey building for students. The development towards Hill Street is non-student residences (low rise, as people tend not to want to buy high rise apartments). That walkway between the Belgrade and the car park is already a wind tunnel, this looks like it might make it reach take off speeds. Why, why, can they not approve something that's only in keeping. Because they want people to feel like rats in a cage. I was in the Town Wall Tavern a few months ago and got talking to a retired couple who had recently moved into the residences near by they were delighted with it as it was so quiet considering it was in the city centre and loved the pub as most of the clientele were of a similar age. I wonder what they'll think when they see this? Have any of you lived in student halls? Rats in a cage? Certainly not. Probably corridors with bedrooms and shared communal spaces. Slap bang in the centre of the city in walking distance to the university. Absolutely brilliant - I did it for a year and it was far better than being stuck in some grim inner-city terraced house owned by a landlord who didn't maintain it surrounded by people who clearly didn't want students nearby. Or, even worse, two miles out and forced to get late night buses or taxis. I'd choose a hall over that any time. It makes perfect sense for this to be a high rise building. The cost of land means a high density of students is needed to make it viable, and it's a decent size for a city of Coventry's size. The low rise area is for non-student housing as high rise flats are a hard sell these days. As for it 'fitting in', well, the area is mainly 20th century with a few fragments left over from the past. Maybe if they hadn't been so hasty in clearing the old city away, it wouldn't be the case. There's a bit of a terrace (that's dominated by a high rise car park) and the Bond's School/Almhouses. The development remains low rise near here, anyway, and this aspect is only outline. The other end of the site is the Belgrade Theatre and the recent car parks and Belgrade Plaza buildings (Sava House). And the whole area is bounded by the beloved ring road and a series of dead ends, no-through roads. The lower two floors facing the walkway are going to be three retail/restaurant units. This should be a boost to the area. I imagine the landlord of the Town Wall Tavern is probably going to benefit hugely. An even bigger advantage of living in it is that you don't have to look at it! Believe me, for students coming to Coventry to study, this building would be one of the least offensive things to look at. Maybe they're designed to appeal to foreign students & their parents who may well think they're wonderful. They seem to charge £153 per week for them: Study Inn - student accommodation I'm not sure what you could build which would be "in keeping". The whole centre is now a bit of a muddle of styles and materials whereas the original Precinct was in a unified style. As soon as they started mucking around with it, it went wonky. I'm a fan of students bringing their cash to the city. If they have a nice life here it's good P.R. for Cov and the U.K.
On 27th Sep 2015 6:51pm, NeilsYard said: Why, why, can they not approve something thats only in keeping. Because it would break the planning laws and regulations and they'd be sued. In keeping what? The city centre stagnating and under-performing? Far more of that area is post-war, so surely this is more in keeping than some throwback to a bygone age? Besides which it's very subjective. You build stuff 'in keeping' and you get people asking why we do that and don't build larger and more modern stuff to attract more people and business rather than becoming this quaint relic visited by the occasional bus tour. You need to do both to attract as wide a range of people as possible, but if you HAD to choose one over the other, it would have to be the new. You look to the needs of people now and in the future, not those that have been dead for centuries. As people have pointed out there is a lot of old stuff in and around the city centre that no-one knows is there, lying un(der)used. It doesn't bring people or businesses into the city centre, so what exactly would you suggest we do with this stuff that's 'in keeping'? I don't want the city centre to become some student ghetto/American style campus, but neither do I want them ostracised or made to feel unwelcome. Students bring with them problems, as do any group. Rich drive up house prices and make them unaffordable, poor and social housing tend to bring more social problems like drink, drugs, litter, noise etc. The trick is, and it's difficult to achieve, to get a balance of all these things and people together to make it as viable for as many people as possible. 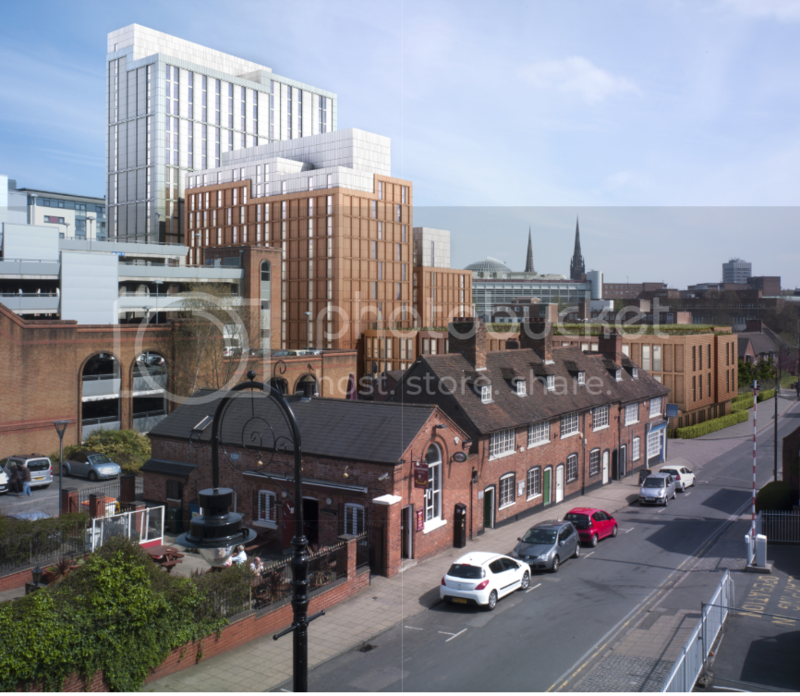 I don't mind student accommodation being provided, but I do fear about it becoming too large a proportion of the city centre and if trends change away from uni education it will leave a large amount of empty buildings. But I have the same cautionary tale to those who constantly call to bring back all the automotive industry. They seem to remember the good times and handily forget the long time in the doldrums this city went through after when it all went down the pan because it was so heavily reliant upon it. Let's have SOME car industry by all means, but lets not focus all our energy on it. What I can't stand the most is when smaller units and houses are converted for student use as it barely makes a dent in the numbers and huge amounts of housing stock are taken up by landlords who don't care about the area or the upkeep of the house. This will be far better for Coventry residents and the students. Plus it may also be part of a replacement for Priory Halls, and the sooner that eyesore goes the better. Hi all A picture. Note the fountain working. "Well, I never!"! A couple of years ago I was talking to a couple in the Town Wall Tavern who had just moved into the sheltered accommodation down the road from the pub they told me they had moved from Coundon and couldn't believe how quiet it was I wonder what they'll be saying once the students move in.